Print out the form attached to the URL below. 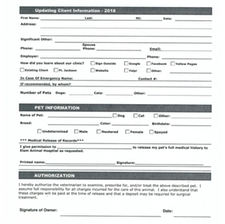 You can either bring this form in with you at the time of service, or email it to us at elamanimalhospital@gmail.com. Please Email us at elamanimalhospital@gmail.com to recieve the complete form.